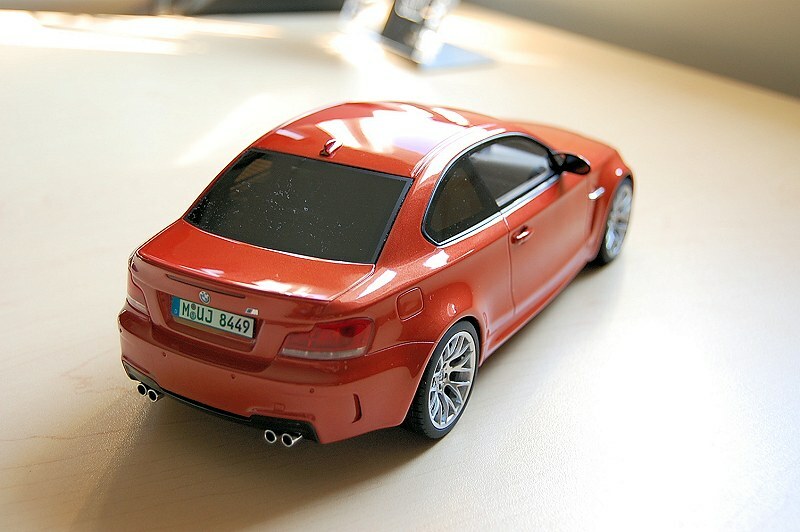 If someone asked me what I wanted to see in 1:18 scale, or what was missing from a collector’s perspective, my answer would be the BMW 1M Coupe (e82) within the top three suggestions for sure. 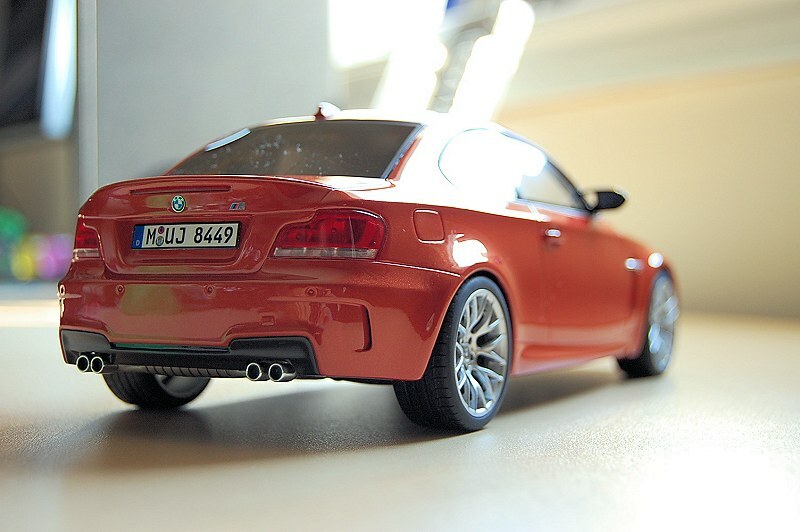 I’ve been yelling as loud as possible for the last few years to see this mini M3 killer come to life in scale form. 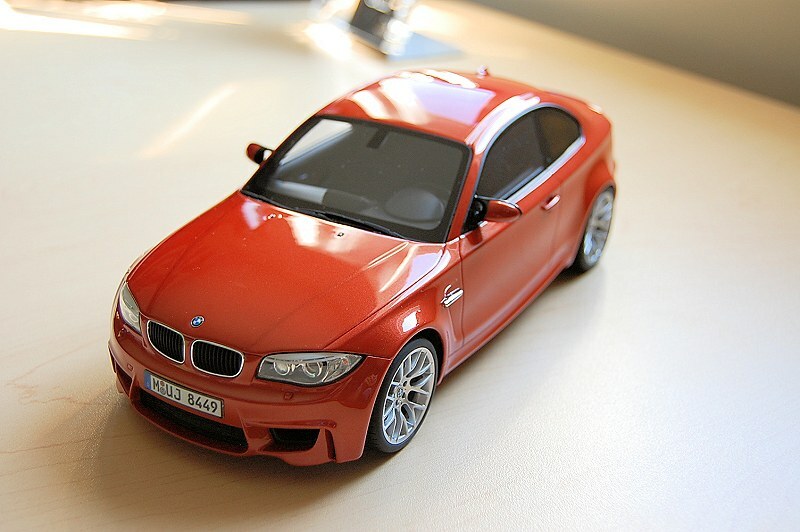 Well the team at GT Spirit answered my prayers, and late last August the Valencia Orange BMW 1M Coupe was officially released. 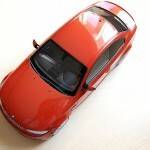 This limited edition model from BMW was released in low production numbers world wide. I don’t believe Canada received more than 300, all of which were issued in three colours: Valencia Orange, Alpine White and Black Sapphire. 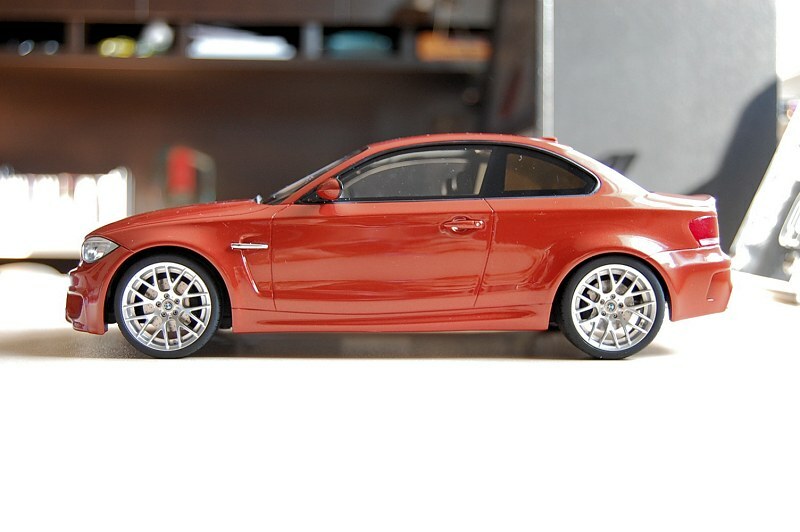 The BMW 1M Coupe is the first M Coupe that is dominated by a muscular look like no other M series car to date. Along with being an M car it must perform, and it does. 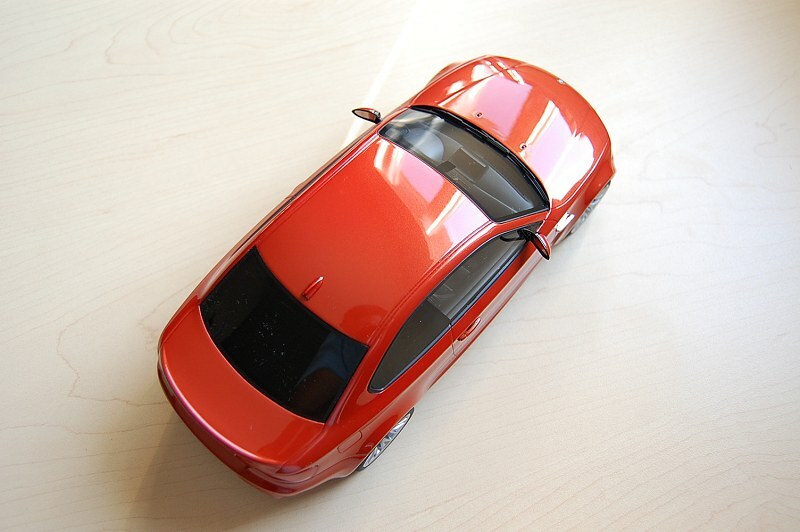 The car is mated to an in-line 6-cyl (2979cc), twin turbo engine. Max power is stated as 335bhp @ 5900rpm and torque 369lb ft @ 1500-4500rpm. Top speed is limited to 155mph. That’s a lot of punch and very tunable punch for a very aggressive price point (less than $50,000CND). So how did GT Spirit do? 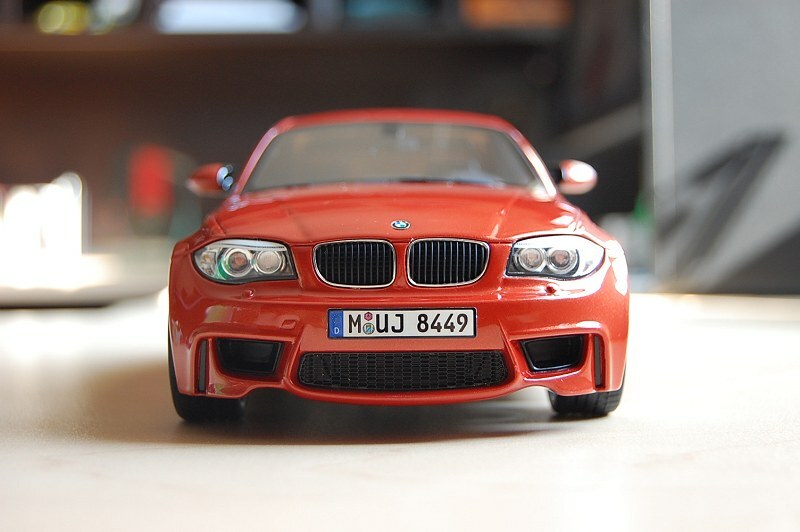 The exterior of the BMW 1M, as mentioned earlier, is extremely aggressive front to back. GT Spirit, in typical form, does a great job in capturing all the lines, muscles and curves. Paint is consistent and smooth throughout. 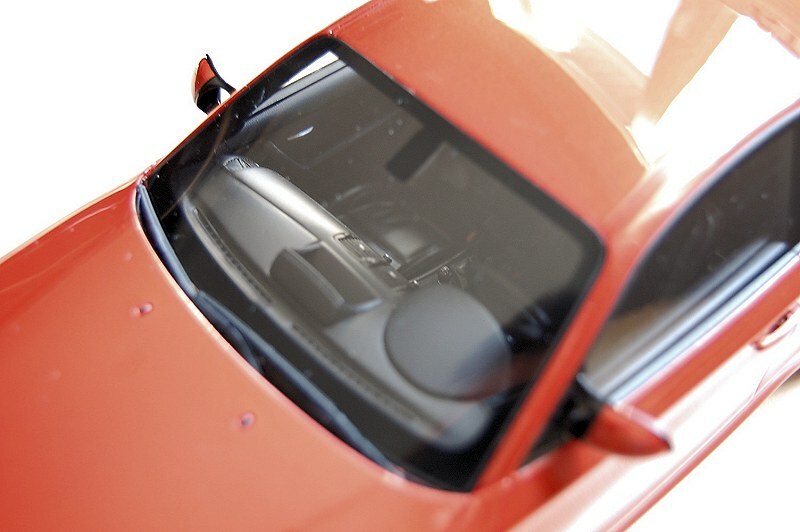 Shutlines and panel gaps are perfect, and expected as this is a resin sealed replica. 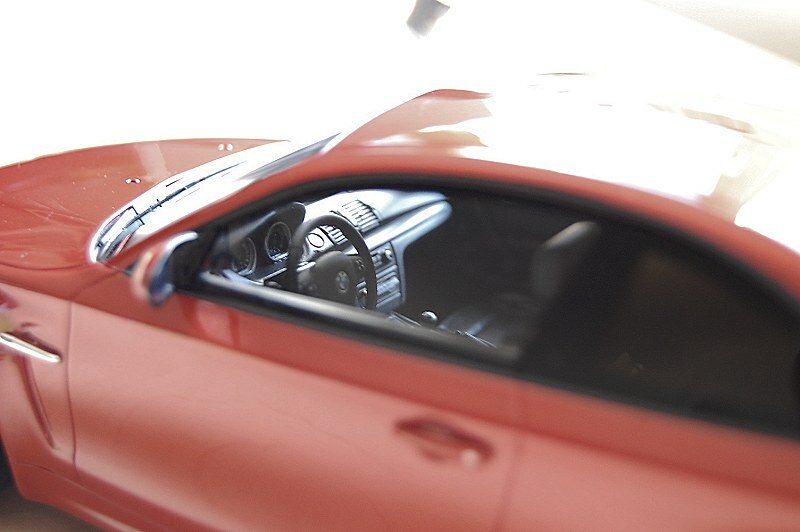 Front fascia is beautifully detailed on many levels. For instance, the aggressive lines on the lower chin/bumper are nicely executed. Lower centre opening does feature a perforated grille as do the upper ones. Detail on the front headlights is much better than average, maybe some of GT Spirit’s best to date. Moving to the rear, the aggressive theme continues. What dominates here are the quad pipes of the exhaust system, two on each side. What is also nice to see is how GT Spirit captured the low sitting muffler – view from the back side you can see the thin lining of the muffler protruding just slightly below the bumper line. 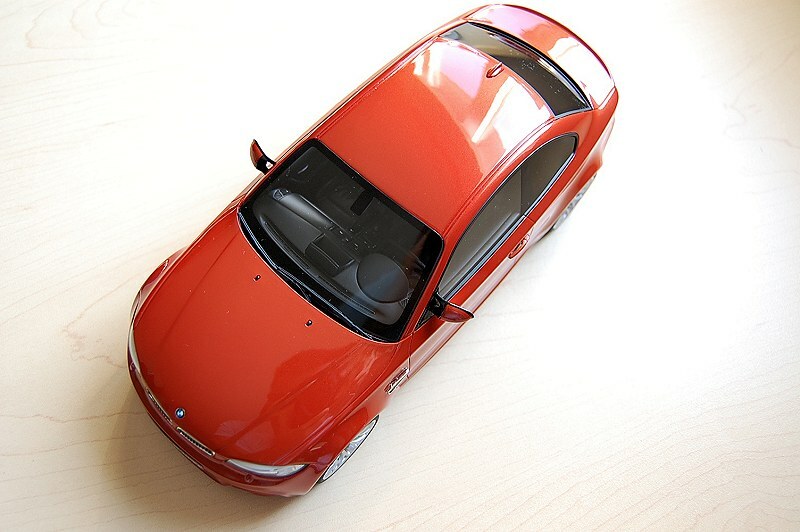 Two other mentions on the exterior detail are the execution on the M-style mirrors, very nice, and the tinted glass on the rear and two sides. 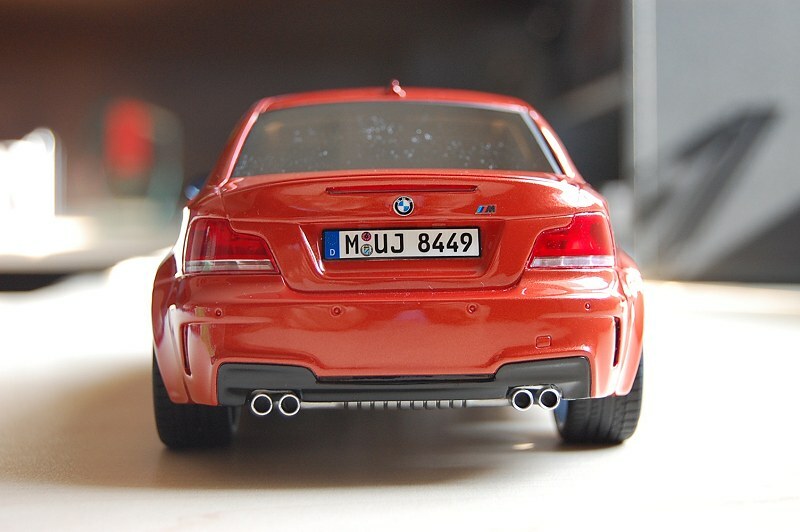 Sometimes the smaller details are overlooked for the sake of margin and production, but not in the case of the BMW 1M. 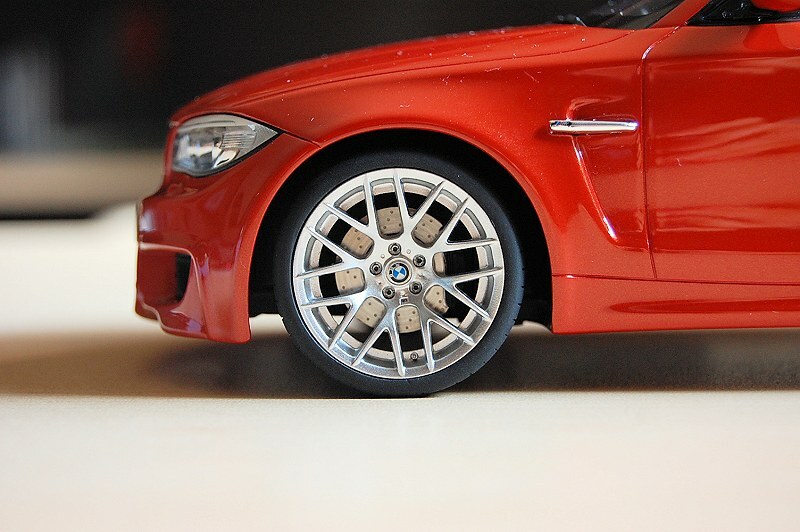 The wheels are always a favourite element of models for me. Though the package here, wheels and brakes are for the most part flawless there is a slight miss here, and maybe the only miss for that matter. The tire profile in my opinion is slightly off by a hair, it’s too small. I gave them kudos for the overall detail, especially on the rotors, that show brake wear. The interior is nicely appointed, and all elements seem to mimic the original, though it isn’t perfect. I know for a fact the Canadian version of the car had dark alcantara with orange contrast stitching covering the door panels, door pulls, instrument cluster binnacle, dash panel, gearshift, and handbrake lever boots. This is something that is not found on the model. Can someone confirm if there was a European option to exclude them? 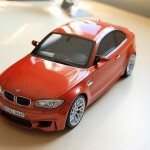 First off, kudos to GT Spirit for finally producing the BMW 1M Coupe in replica form. I can sleep easier now. The overall package here, for the most part, is top notch. Don’t let the interior issues stop you from enjoying this beautiful car and replica; I’m sure there are many enthusiasts like me that have the same placeholder for the 1M in their collection. If you can get your hands on one, BUY IT! Enjoy the pics! 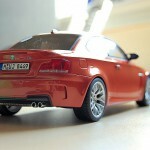 4 Responses to "REVIEW: GT Spirit BMW 1M Coupe"
Anybody found a dealer in Canada that brings in GTSPIRIT models? I keep ordering directly from them and paying their ridiculous shipping fees and they can’t seem to understand that they shouldn’t be charging non-European residents VAT. I asked Derrick at Toronto Motorsports and he said “never say never”, but they don’t seem to be playing ball and there is no distributor in Canada as yet either for GT Spirit or Ottomobile. Was just on eautomobilia.com and they appear to get GTSPIRIT and TOPMARQUES. If that is the case then that is fantastic. Hi, we try our best to provide GT Spirit to Canadian collectors, please email for a quotation.